As part of its Initiative 2022 strategic plan, Saur announces the 100% acquisition by its Spanish subsidiary Gestagua of Nuinsa Inversiones, which held some of the Valoriza group’s equity investments in Emalsa, Sercanarias and Valorinima. This acquisition makes the Saur Group the majority shareholder in Emalsa, the company responsible for water management in Las Palmas (Canary Islands). Having increased its previous 33% holding in Emalsa to 66%, Saur takes over responsibility for management of the company alongside the city of Las Palmas via its Spanish subsidiary Gestagua. Emalsa has managed every stage of the water cycle for the 400,000 residents of the Canary Islands capital since 1993. Emalsa employs more than 300 people, and reported annual revenue of €52.7 million in 2017. The contract managed by Emalsa is a key benchmark in the market for seawater desalination by reverse osmosis using facilities with a total production capacity of 85,000 m3 per day. This acquisition also gives Saur and Gestagua full ownership of Sercanarias (which specialises in high-pressure pipeline cleaning, wastewater treatment sludge management and pipeline network maintenance and contracting), as well as an equity stake in Valorinima, which provides water management services to 40,000 people who live in the city of Soria (north-central Spain). The total value of the acquisition has not been disclosed. As a result of this acquisition, Saur and its subsidiary Gestagua now serve around 1 million people in Spain, where it generates annual revenue in excess of €100 million. All of these companies will benefit directly from the body of experience acquired by Saur in France and internationally to further improve consumer satisfaction, operational efficiency and the contribution they make to local economic development. This acquisition has been made in the context of the Initiative 2022 strategic plan designed and implemented with the aim of raising Group annual revenue to €2 billion by 2022. The new expansion plan is underpinned by significant opportunities for growth in international markets. This first acquisition illustrates the new and dynamic commitment to expansion that has attracted the private equity fund EQT, which engaged in exclusive negotiations for the acquisition of the Group by the end of this year. Louis-Roch Burgard, Executive Chairman of Saur, had this to say: “This acquisition strengthens our presence in Spain and allows us to achieve a significant size in this market. 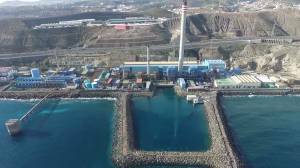 It is also a very attractive opportunity in terms of technological expertise, since the Las Palmas plants are pioneering seawater desalination in Europe. This transaction will form the basis for further development of Group operations in Spain and other Spanish-speaking countries”.